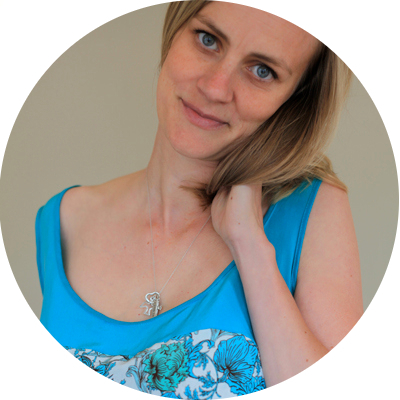 I’m so excited I can hardly find the words… I’m this week’s BurdaStyle Featured Member! Take a look! Take a look at my new sewing corner! Wiley is. After work tonight I hung my thread rack and a push-pin board on the blank wall you see behind the table. I now have my most recent project sitting right next to my machine waiting for the next chance I get to sew. And, the drawers are now all full of patterns, interfacing, scissors, ribbon, and all the other sewing-related items I’ve collected to date. I didn’t think I needed a sewing space, but I have to say it’s feels really nice to have one. It’s been a good day. I hope the same is true for all of you. Happy sewing! Just found your blog through your feature on BurdaStyle. Congrats! Someone was going to junk that gorgeous table?! I’m glad it’s got a new home and you’re enjoying some dedicated space. Your cat is adorable too! Seriously- that table is a great find- I love drawers close at hand! Congratulations on the BS feature – very cool. 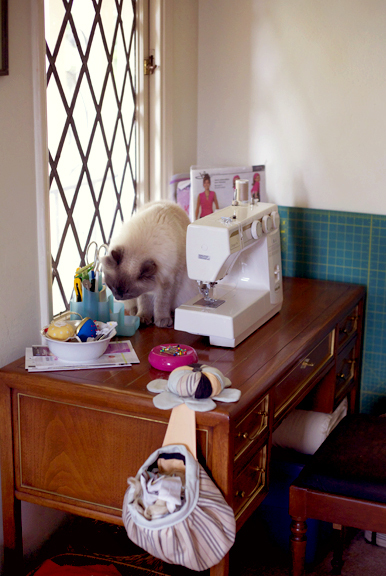 And it is nice to have your own sewing space isn’t it? I used to sew on the dining table and kept the machines and stuff all in cupboards. So so so nice not to have to move everything about just to get sewing. Congrats on the feature! Hooray also for the new sewing space! I know what it’s like not to have one. The new table looks lovely. You will enjoy your new space. Congrats. Hooray! What a great day! Your little sewing corner looks so cozy now! Congratulations on making Burdastyle – and what a find!! I think Wiley approves. FANTASTIC! What a great day! Congrats on the feature AND the new sewing table!!! Congrats! I started following your blog this year and I’m glad to see you featured on Burda! Congrats on being the featured member on Burda Style…that’s exciting. Love that little vanity you found…isn’t it amazing what people throw away? I too have a portion of my small living/dining room dedicated to my sewing room — the upside there is it forces me to keep things organized, and tidy. Just catching up on some reading and found you on the BurdaStyle feature. Your work is fantastic! Would you mind telling us where you found that wonderful looking dress form? Thanks for the compliment! I actually inherited my dress form from my grandmother. It is fun and very adjustable! Thank you! It’s even cuter now that I’ve hung things on the wall over the area!! It’s been fun having a nice corner for my projects!